This hotel is located in a quiet side street in the Kaulsdorf district of Berlin, near the B1 road and a 10-minute drive from the A10 motorway. 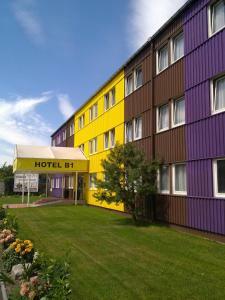 Hotel B1 offers free WiFi as well as free parking. All rooms are non-smoking and feature a flat-screen TV with international channels, windows that open, a wardrobe, bedside table and a modern bathroom with shower. Guests also enjoy 15 minutes of free in-house calls or free landline telephone calls within Germany. A rich breakfast buffet is available at the B1 every day. Guests are welcome to use an internet terminal for free in the lobby, or relax and smoke in the bar with a free pool table and large flat-screen TV. Snacks and drinks can be purchased at the vending machine 24 hours per day. In warm weather, guests are welcome to have breakfast or enjoy evening drinks in the garden. The Kaulsdorf S-Bahn (city rail) station is just a 15-minute walk or 3-minute bus ride from the Hotel B1. Direct trains take you to the famous Alexanderplatz square in 25 minutes. The Welcome Card is sold at reception, offering public transport and discounts on sights in Berlin. 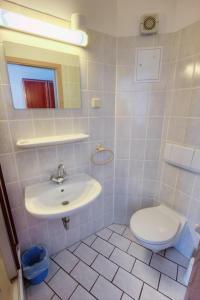 Simply decorated room with a TV, telephone and private bathroom with complimentary toiletries.